February 25, 2019 March 3, 2019 Red. 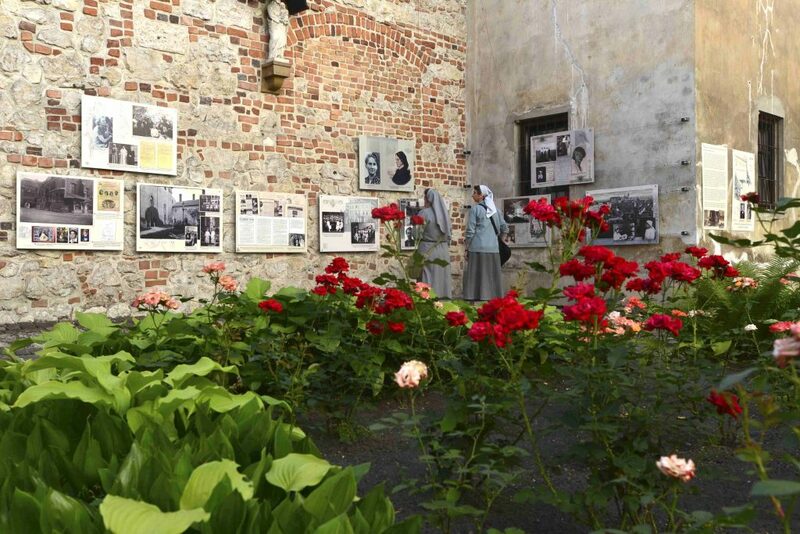 About “Blessed Nurse Hanna Chrzanowska, Lady of Mercy”. 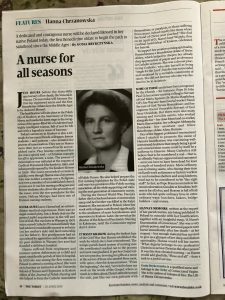 In connection with the announced beatification of Hanna Chrzanowska on April 28, 2018, the Publishers of the Małopolska Chamber of Nurses and Midwives in Krakow bearing her name, decided to prepare and issue an extraordinary publication related to this unique event. We therefore turned to people from different backgrounds who collaborated with H. Chrzanowska at various times in her life, with an invitation to participate in collecting and presenting her reflections and experiences related to her. That they would become co-authors of the planned publication, protecting from oblivion and preserving the obvious facts from her life for the next generations. Many of her relatives, unfortunately, are no longer alive, but their very significant relationships and memories remain, which should not be forgotten. And that’s how the collected material was arranged by us and presented in the compact publishing position of “Blessed Nurse Hanna Chrzanowska, Lady of Mercy”. As co-editors and co-editor of this publication, by education nurses and nurses, each and every one of us individually, we present a brief information about the process of its creation. KAZIMIERA ZAHRADNICZEK The history of nursing in Krakow is particularly close to me, not only because of the position under this title and co-organization of the History of Nursing Salon of the Institute of Nursing and Midwifery of the Faculty of Health Sciences of the Jagiellonian University. I also hoped that a decades-long relationship with nursing and nurse education would enable me and would facilitate the collection and preparation of material for this publication. 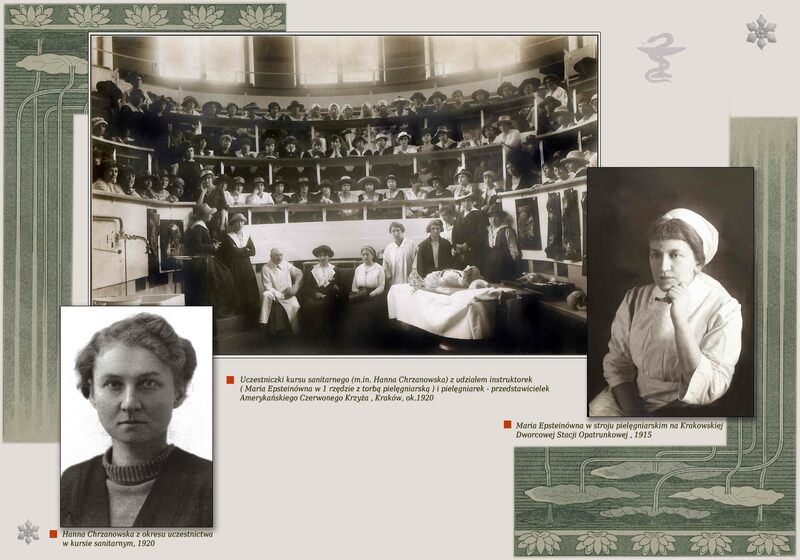 During my studies at the State School of Nursing in Krakow, H. Chrzanowska did not work anymore, but her co-workers, teachers, didactic materials and theoretical and practical methods were introduced. In this atmosphere, which she created and left, further groups of students were educated. And in the following years, I had the opportunity to participate in meetings with her. The material and its contents collected for this publication aroused my admiration and admiration, and at the same time I was afraid to cope with the challenge. 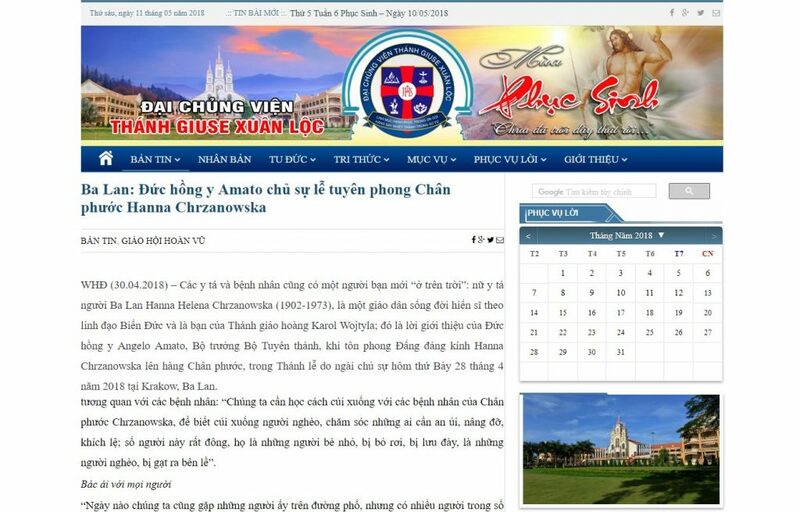 It is more than dozens of articles depicting accounts of witnesses from different periods of life of H. Chrzanowska. 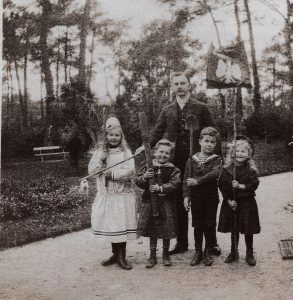 These relations present the environment in which her unusual personality was shaped, which had such a significant impact on the development of nursing in Poland. But also the impact on relationships between people, perception of those who can not or do not want to help themselves. They present the path of her professional and scientific development, the use of scholarships in the countries of Europe and the United States, as well as the transfer of acquired experience to the education of nurses and professional practice in the country. She did so through very numerous publications, activities in professional associations, but above all in direct contact with educated nurses and people under her protection. She especially developed, based on scientific principles, her beloved nursing of the sick at home, “which she knew how to find, especially those who required special care”. She became an authority for nurses and nursing during her lifetime. She was invited to meetings not only with nurses and students of nursing schools, I was a participant in such meetings. 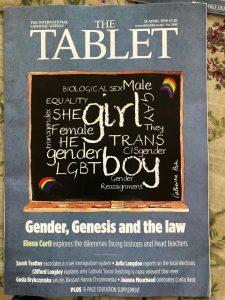 After the death of many schools, her name was given, and even though some of them ceased to function, their graduates talk about it and write with pride, also in this publication. Her scientific achievements in the field of nursing theory and practice as well as universal ethical values ​​and attitudes became the basis for organized scientific conferences. 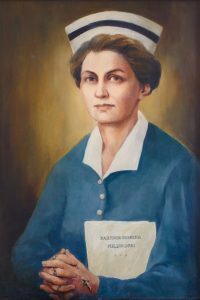 “It should be remembered that Hanna was considered a pioneer of Polish nursing in her lifetime, and even if she was not beatified, papers, books and doctorates would be written on it. I think so “, wrote Małgorzata Brykczyńska. I share this opinion. I hope that this publishing position will be, not only for the community of nurses and midwives, a moving documentary about the precursor of our profession, and for candidates, perhaps an incentive to follow her path. HELENA MATOGA In preparing our publication, we wanted to show the figure of the Blessed Nurse in the fullness of her life, childhood joy, youthful enthusiasm, family tragedies, cares, life challenges, joy of work, friendship and entertainment. Her maturing and deep faith in God, up to the elevation on the Altar. We could do this thanks to her personal souvenirs, as well as those donated by her family, friends and borrowed from the Chambers of Tradition from schools bearing her name. Personal souvenirs were collected by Alina Rumun, the closest collaborator of Hanna Chrzanowska and the performer of her last will. Unfortunately, important original documents related to her professional education were probably destroyed during the war. Many of them had to be played on the basis of witnesses’ testimonies. My query in the State Archives, the Institute of National Remembrance, and others, provided many unknown documents, especially from the Second World War, confirming her murderous work in the Central Welfare Council (RGO). 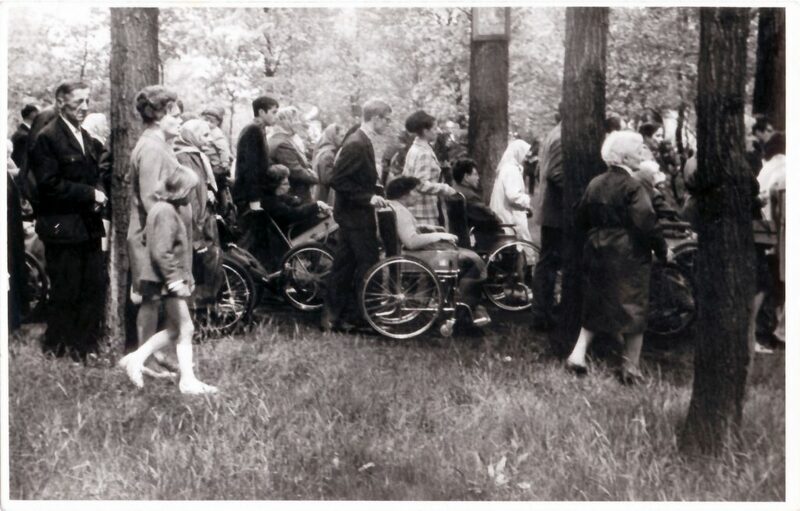 On this occasion, I discovered the documents of nursing parents associated with the conspiracy, as well as the surveillance of some fellow nurses and the environment of nurses associated with the Krakow church as well as retreats organized during the PRL. I have included this information in my book “In the circle of the caring cap”. These materials served the Historical Commission appointed by Fr. Cardinal. Franciszek Macharski, to document the attitude of the heroic Servant of God H. Chrzanowska in the proceedings. 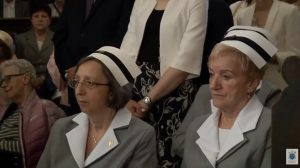 Used, not reserved, they were the beginning of the archives of the Catholic Association of Polish Nurses and Midwives (KSPiPP), which was located, thanks to the kindness of the Małopolska District Chamber of Nurses and Midwives (MOIPiP), at its headquarters. For the creation of the prepared publication, in my case happily the fact that I was a student of Blessed, who was my Mistress. Also, the fact that I was a witness of a widening opinion about her sanctity, I heard it from her charges. It was also the culmination of the work which was imposed on me by my older colleagues in 1993, and which was sanctioned by Fr. Cardinal. Franciszek Macharski in 1998, entrusting me the functions of vicepostulatorki in the composition of the Tribunal in the process at the level of the diocese. I would like to express my gratitude to the successors of Fr. Cardinal. F. Macharski. HE, Cardinal. Stanisław Dziwisz for the costs of the trial, prayer and support. HE, Archbishop Marek Jędraszewski, for organizing and moving the beatification ceremony. TADEUSZ WADAS There is no publication that would show the whole life and activity of Blessed Hanna Chrzanowska, Nurse, Lady of Mercy, as a role model for adepts of nursing art. Hence my decision to participate in its preparation. We are publishing a publication co-authored by the family and students of the Blessed and her collaborators, volunteers and clergy. It is also an attempt to describe the organization and conduct the process of beatification and its solemn ending. The Małopolska District Chamber of Nurses and Midwives in Krakow, was interested in publications about Blessed, and supported them. 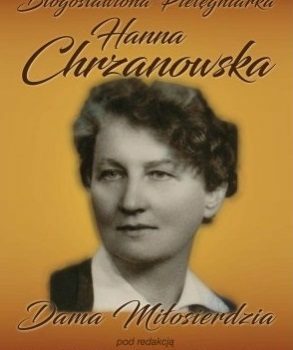 Together with Hanna Paszko we prepared “In tribute to Hanna Chrzanowska”, which was published in 2011, dedicated to young people who are interested in education in the nursing profession. We analyzed the “Nurse’s conscience account”, which was disseminated by H. Chrzanowska, considering dilemmas and ethical problems. She emphasized the proper attitude of the nurse, praising when it belonged, or expressing disapproval, saying: “Disgust for the nurse is a bedsore”. 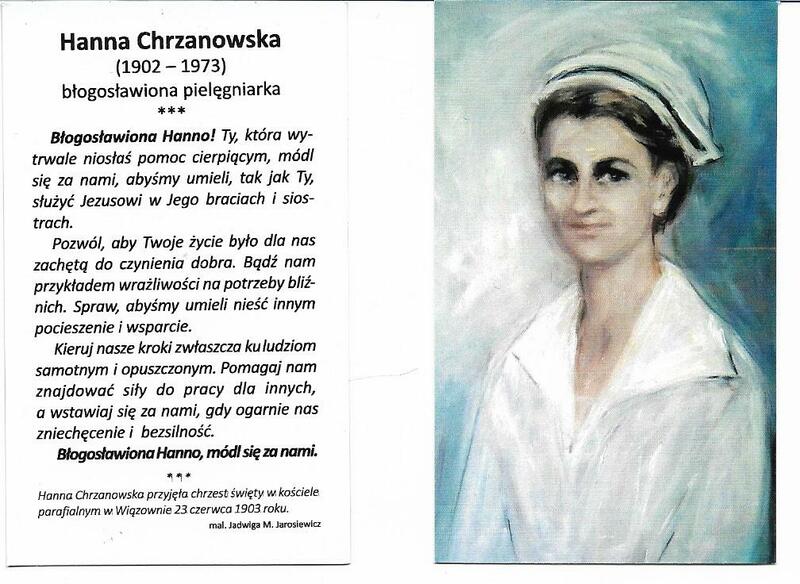 After the publication of the name of Hanna Chrzanowska to our Publishing House, further publications were published, ie Małgorzata Brykczyńska “Blessed Hanna Chrzanowska”, which was given to the participants during the solemn beatification, and Hanna Chrzanowska’s “Memories of the note list”, developed by Alina Rumun and Marzena Florkowska. . 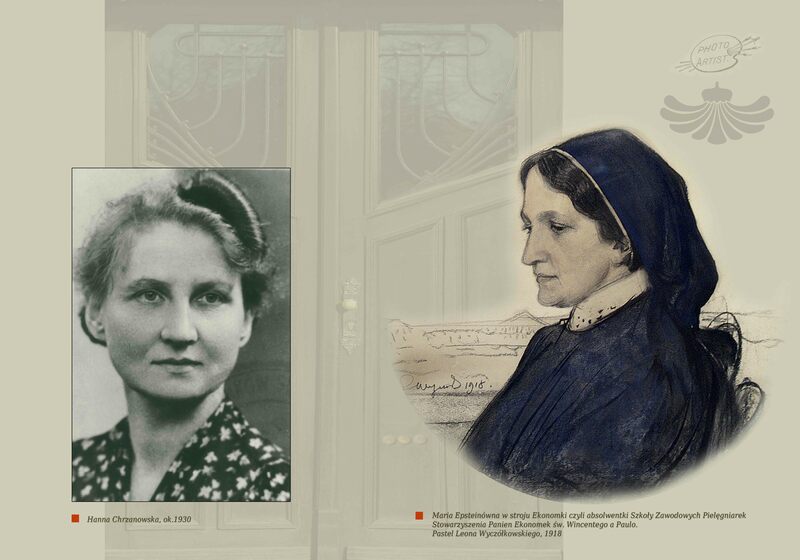 In the pages of our magazine “Małopolskie Pielęgniarki i Położne”, we published articles showing the personality of Blessed and her achievements in the field of nursing theory and practice. While participating in the preparations for the beatification ceremony, we wished that its course would be elevated and remained in the memory of the participants, and documented in the prepared publication remained an eternal memento for those who were not given to be present. Many wonderful people have joined these activities. 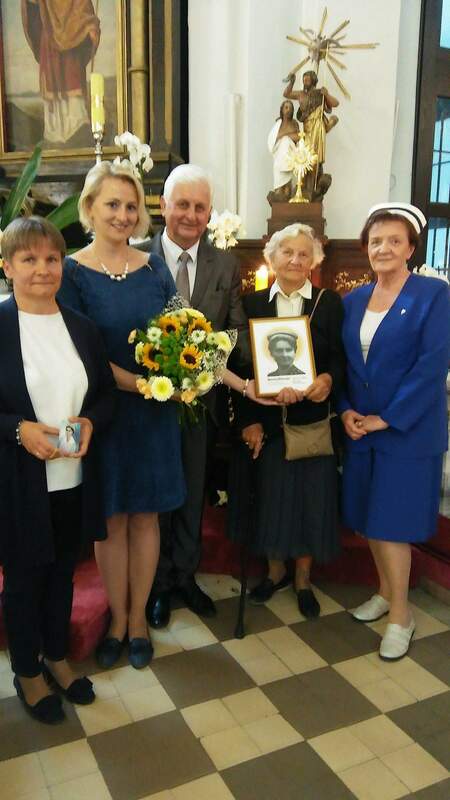 First and foremost, the role of the Catholic Association of Polish Nurses and Midwives in Krakow, the vice postulator of the beatification process, Helena Matogi, nurse priest and midwives of the Archdiocese of Krakow, priest. Dr. Kazimierz Kubik. 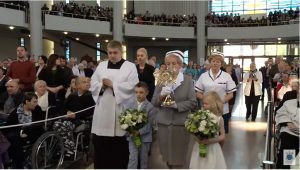 Polish nurses and midwives funded the Lady of Mercy, the sarcophagus, the College of Nurses and Midwives of Poland, the Beatification Picture, Parish of St. Mikołaja in Kraków, reliquary, Małopolska District Chamber of Nurses and Midwives in Krakow, Mass chalice and the Catholic Association of Nurses and Midwives in Krakow, ampoules for wine and water. 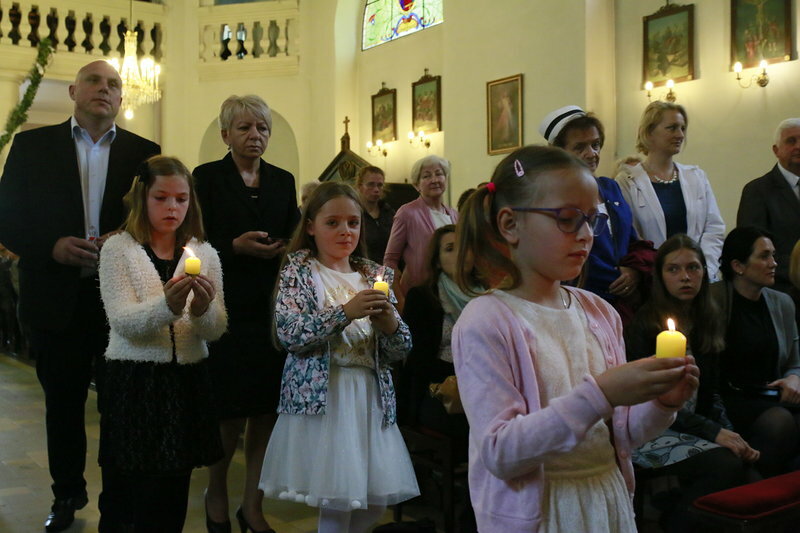 The nursing community from all over Poland contributed to the spiritual experience of this celebration. 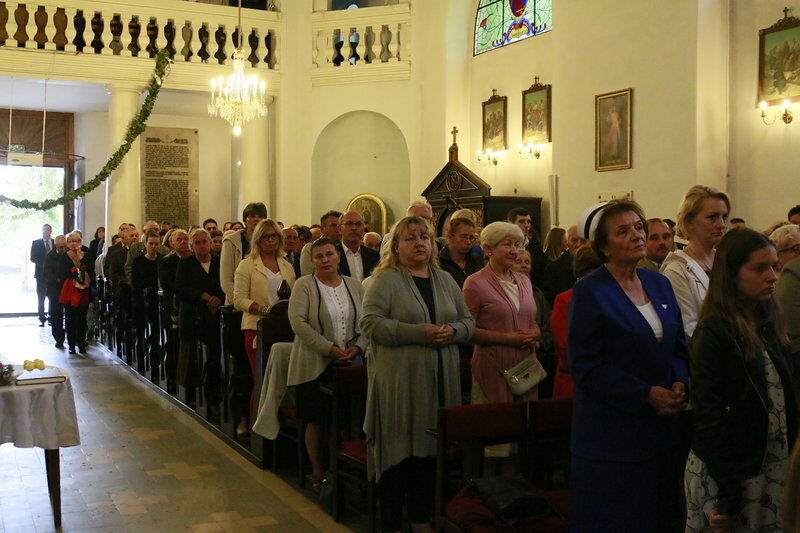 It was accompanied by the flagships of the District Chambers of Nurses and Midwives, trade unions, Catholic associations and schools named after Hanna Chrzanowska, as well as a very large group of nurses and midwives. This has been documented by the description and a multitude of photographs included in this publication. 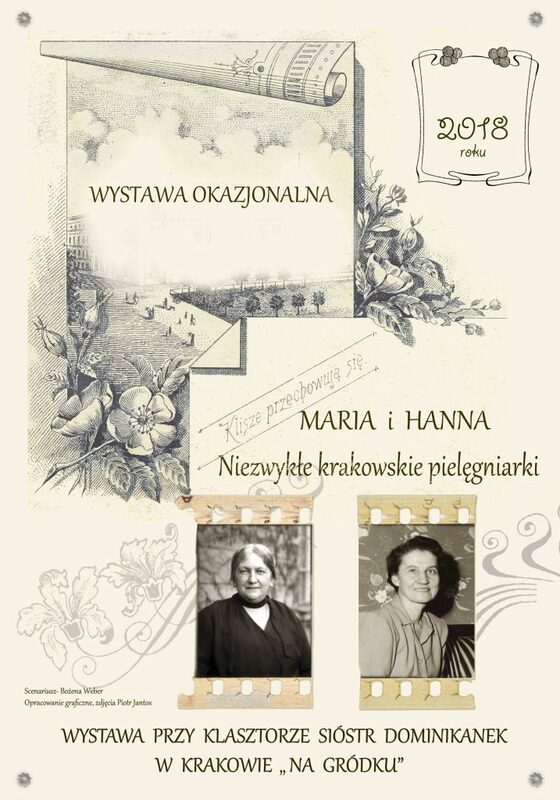 As the editorial team of the publication “BŁOGOSŁAWIONA PIELĘGNIARKA HANNA CHRZANOWSKA DAMA MIŁOSIERDZIA”, we would like to thank all the Authors for their memories, documents and memorabilia that have enriched the knowledge of Blessed Hannah Chrzanowska. We would like to thank the families of those who are no longer living, for providing materials and documents that would allow a more complete presentation of her achievements. We would like to thank the authors that together with the editors, they paid the fee for this publication to the Foundation for the Development of Nursing of Małopolska District Chamber of Nurses and Midwives in Krakow, intended for the Nursing Home for Nurses and Midwives. Na zdjęciu Hania Chrzanowska – pierwsza od prawej, z orłem na znaku. July 15, 2018 July 15, 2018 Red. Church in Wiązowna, in which 115 years ago was baptized bl. Hanna Chrzanowska. A renewed antique baptismal font in which the Baptism of Saint. 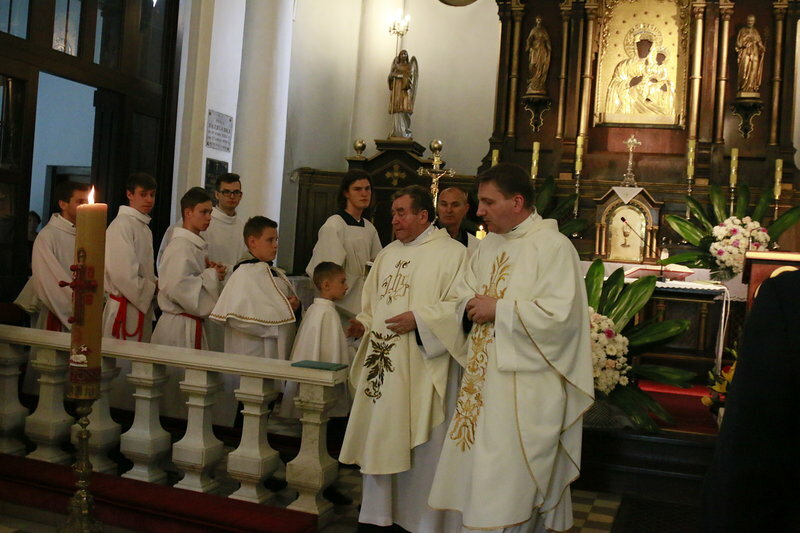 During the ceremony they received the Sacrament of Holy Baptism. two girls. 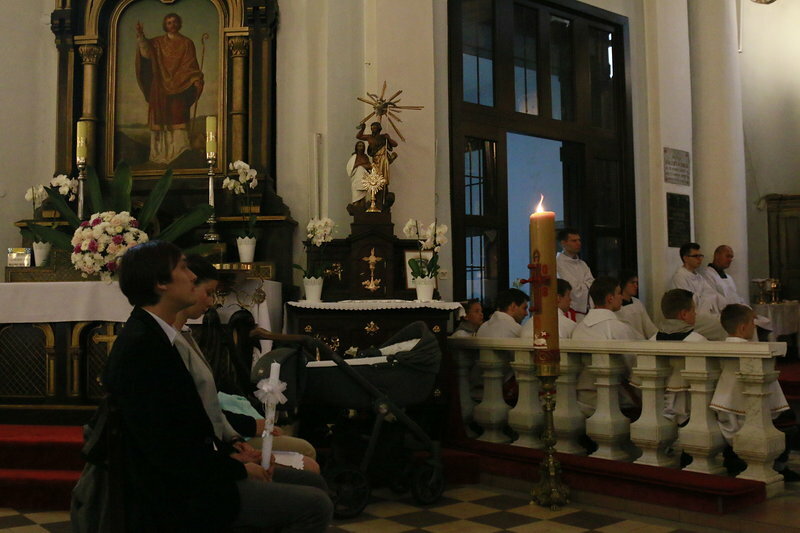 Older people received the Sacrament of the Sick. In the pictures, the National Chaplain of the Health Service, Fr. 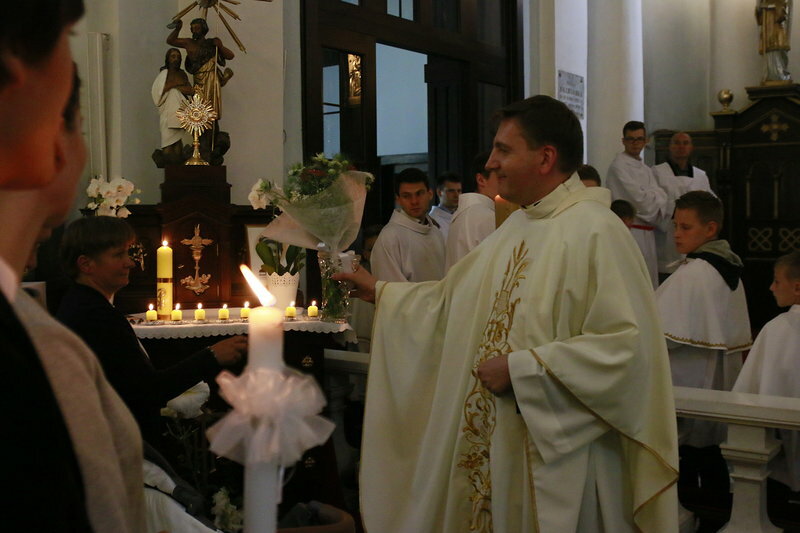 Arkadiusz Zawistowski gives the Sacrament of the Baptism of Saint. newborn. June 9, 2018 June 9, 2018 Red. 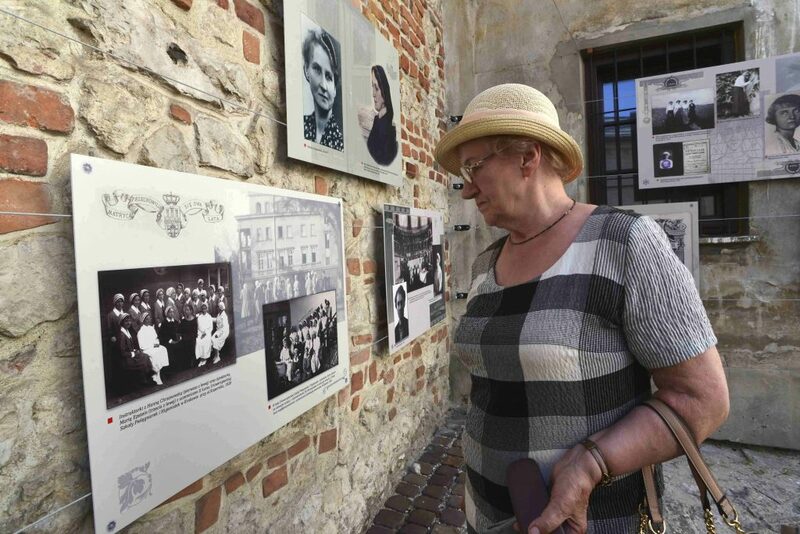 June 7 this year in the courtyard of the Dominican Sisters in Krakow The Gródek officially opened an exhibition dedicated to exceptional nurses who exercised his ministry in the city. 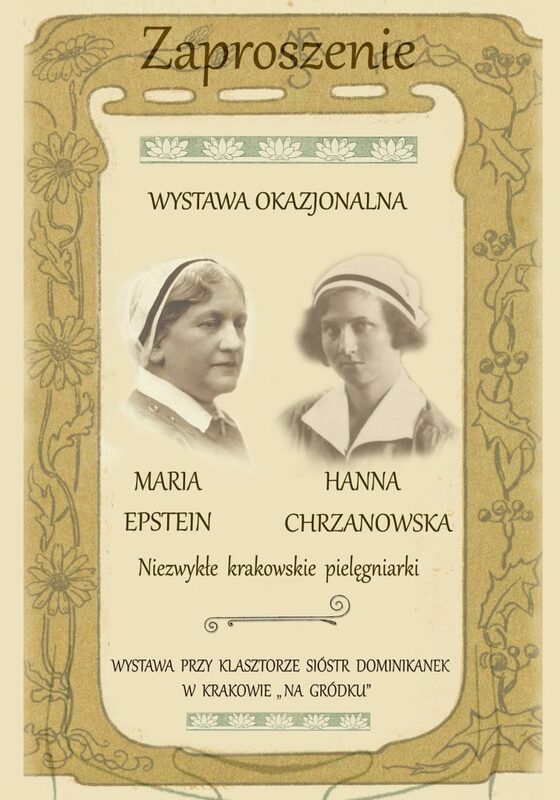 The protagonists are: Maria Epstein – precursor of Polish professional nursing and Bl. 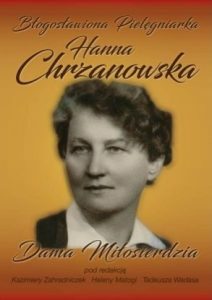 Hanna Chrzanowska who wholeheartedly strive for the care of patients remaining in their homes and help them not only in matters of care for the body, but also the care of their spiritual needs. These two wonderful nurses knew each other personally because Bl. Hanna Chrzanowska was a student of Maria Epstein, and then they shared their sincere friendship, even when Maria joined the Dominican convent. 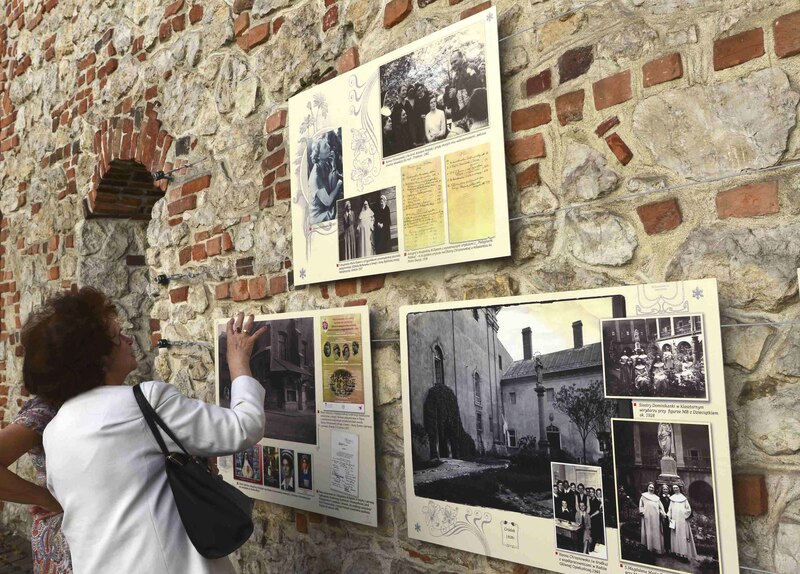 We invite you to visit this very interesting exhibition, to which the Dominican nuns materials made available and which is in the courtyard of the monastery on Gródek in Kraków. Mikołajska 21. The exhibition will be available for two months. June 8, 2018 August 9, 2018 Red. Currently, a sarcophagus with the remains of Bl. Hanna Chrzanowska is located in the southern nave of the church of St. Nicholas, under the altar setting depicting the coronation of Our Lady. The sarcophagus was made of alabaster. On the sarcophagus, the inscription: Blessed Hanna Chrzanowska, Nurse, 1902-1973. The author of the project is Mr. Stanisław Juszczak, and the founder of the Catholic Association of Polish Nurses and Midwives. 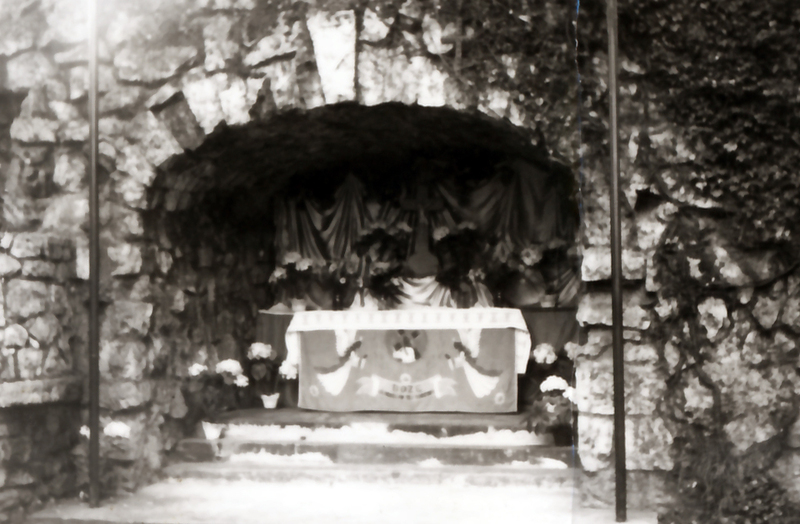 Many devotees pray at the sarcophagus, entrusting their intentions to the new Blessed. 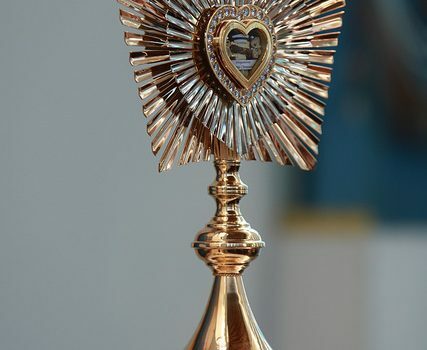 In addition, the parish of St. Mikołaj invites you to the weekly Adoration of the Blessed Sacrament with Blessed Hanna Chrzanowska and the monthly Holy Mass. for the sick. 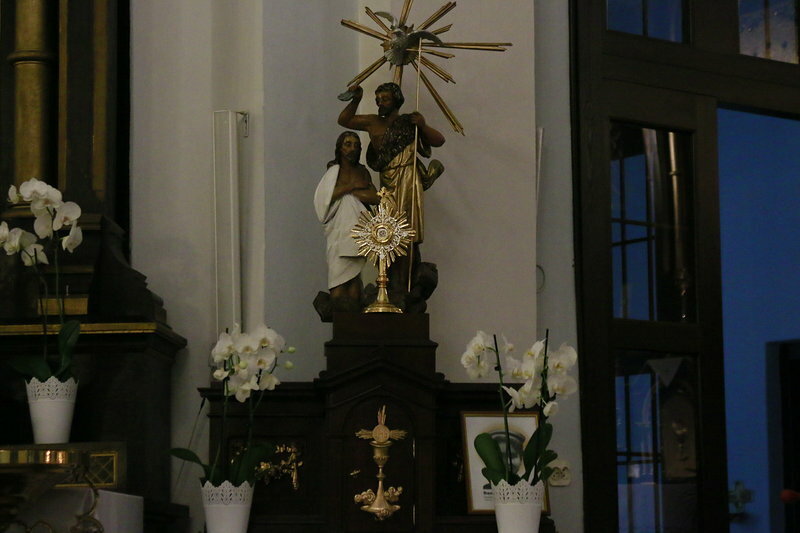 (after the Mass – litany to Blessed Hanna and the celebration of her relics). June 7, 2018 June 9, 2018 Red. 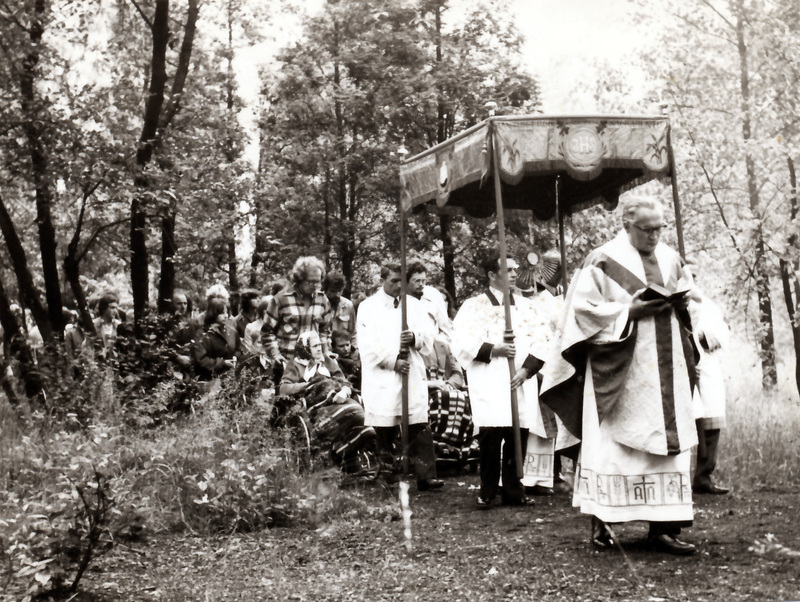 Beatification portrait – the picture shows the figure of a 30-year-old nurse – Hanna Chrzanowska. In her hands, Blessed is holding a rosary and the Account of the conscience of the nurse she is the author of. The portrait was painted on the basis of photography. The author of the painting is Mr. Zbigniew Juszczak. 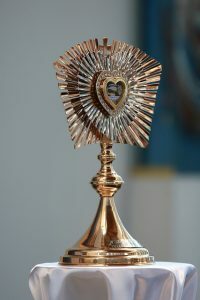 The reliquary – relics of the Blessed were placed in a heart-shaped capsule – a symbol of giving one’s life to another. The heart has been decorated with stones to emphasize feminine delicacy and beauty. The whole is closed in the shape of a classic nursing cap, a symbol of the mission undertaken by Blessed Hanna Chrzanowska. The author of the reliquary is Mr. Marek Nowak from the Manogold company from Zabierzów. May 2, 2018 May 11, 2018 Red. April 29, 2018 April 29, 2018 Red. 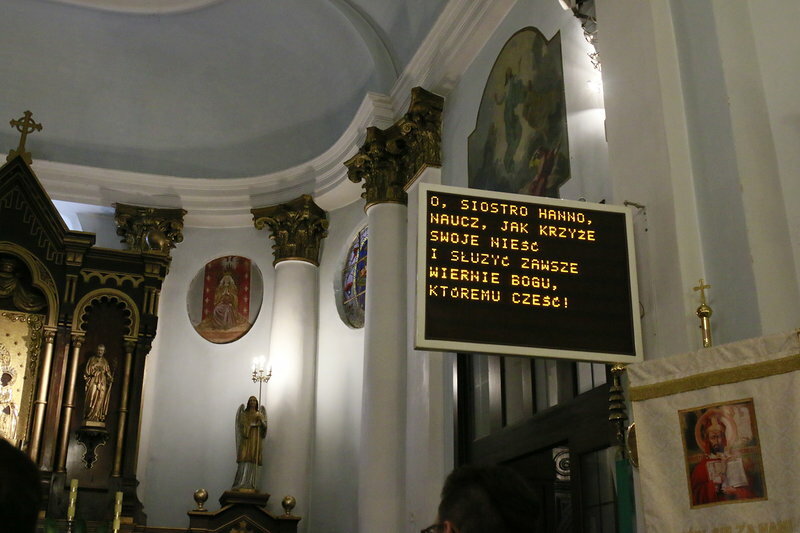 Holy mass thanks for the gift of the beatification of Blessed Hanna Chrzanowska – Nurse, in the parish church of St. St. Nicholas in Krakow, where the remains of the Blessed are resting.